Copper liquid paint contains 19% copper flakes, packaged for the individual consumer and distributed by an experienced contractor. 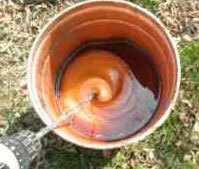 Copper liquid paint consists of a flexible, weatherproofing outdoor coating. For you, this product offers an attractive copper finish that can be applied over numerous types of surfaces. Since the copper alloy flakes are present, the copper liquid ages to bronze then eventually to patina green. The artist, Iron John, used this product on his artistic project. 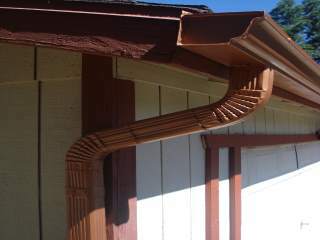 Almost any gutter, no matter how cheap from Home Depot or Lowes, can be painted by a DIY with this product. Any concerns about theft disappear. You have a choice of watching the gutters and downspouts age in color…or block the aging with clearcoat to maintain an new sheen. 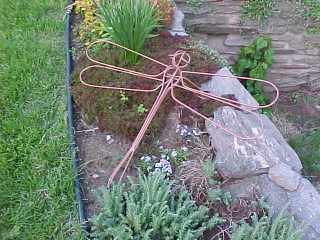 Gardens and lawns are a logical place to paint some dull piece of junk, such as bird baths, pails, fencing detail or a big, metal bug. 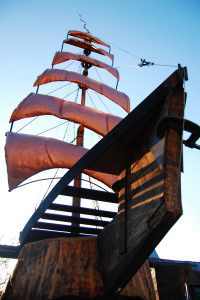 This copper paint is more than a metallic spray; the coating is a high quality finish. For those who like to touch, smell and taste before buying, just email your name and address for a cured sample of the finished copper liquid paint. One side of the sample illustrates the coating straight from the pail; the other side shows an application of clearcoat over the copper paint. To send an email, just click to the Contact page.